Last week I recorded some videos of my little girl's five years birthday with Panasonic TM700 and I want to join the bunch of video clips to one big file and convert them to MP4 so that I can playback it on my DUNE HD Player. Bundled software HD Writer AE2.1 produces strange artifacts after clips merging together. Video and audio is out of sync and sometimes the file freezes for no reason and I have to start playing from the very beginning. The experience is so frustrating that we can barely enjoy the video on my TV. So I asked for some help on some forums and was recommended to try freeware txMuxeR which can help me to merge mts files. With no batch process in txMuseR, this is too time-consuming for me as I have over 30 small clips to be processed. From some thread on the same forum, I also tried out a third party software called Aunsoft Final Mate which happens to do exactly what I want – merge TM700 1080/50p MTS files to one single MTS files without re-encoding, and then convert them to MP4 for my Dune player. There are two ways you can handle your TM700 AVCHD videos. You can either backup videos to computer first or directly extract videos to Final Mate for future editing. - Capture Panasonic AVCHD videos from camcorder. To load videos from camcorder, just connect the camcorder to computer with USB cable. Run Aunsoft Final Mate and choose to follow wizard. Select "Import" instead of Backup to quickly capture videos from camcorder. You can find imported videos under Camcorder tab in the main interface of Final Mate. - Import Panasonic AVCHD videos from computer. If you have already backup all your video recordings on your computer, you can browse your video path and the software will automatically show your AVCHD clips in Resource tab. After you successfully imported AVCHD 1080/50P MTS video clips to Final Mate, you can press Ctrl+A to select all AVCHD files, and then drag and drop them to Movies tab. A pop-out window will show up to help you make choice. Choose "Create A Single Movie" and all the MTS video clips will be merged as one single movie immediately. If you are the first user of Final Mate, please click the format icon to “Change Output Type to Conversion” in the first place, and then click the format icon again to choose target format for Dune Player. Final Mate offers optimized format presets for various HD Media Players, including WD TV Live, WD TV Live Plus, Popcorn Hour A-210, Popcorn Hour A-200/C-200, TviX Slim, Dune Player and more. You can simply select “Dune BD Prime 3.0 Video (. *mp4)” as target file type. 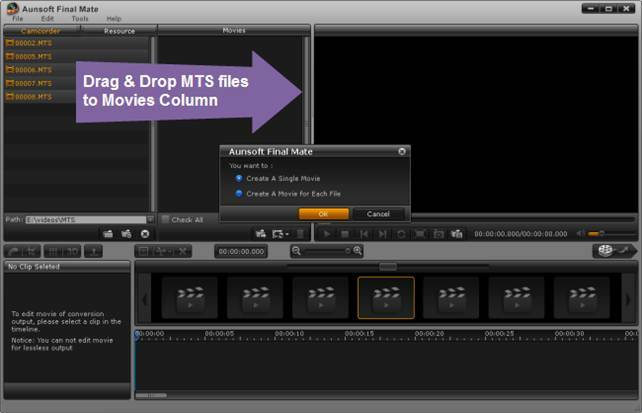 When the above mentioned steps are done, click “Export” button to start converting merged MTS to MP4 for Dune Player. After the conversion is finished, you can put the media to DUNE HD Player through external hard drive or stream your media to your TV. That's all.